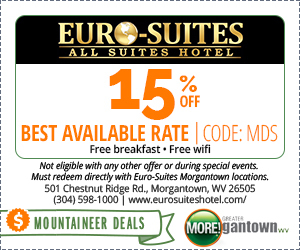 Next to West Virginia University, this all-suite hotel with extended stay options is a 13 minutes’ walk from the Medical Center people-mover station. The straightforward 2-room suites feature 37-inch HDTVs (2 per suite), free WiFi, pull-out sofas, and kitchenettes with fridges, microwaves and coffeemakers. There’s a meeting room, a 24-hour gym and a 24/7 business center on-site. Freebies include continental breakfast with hot dishes, evening happy hours with free appetizers, and free shuttle service to and from the local airport and hospitals. Guests can dine at a sports bar or a restaurant serving Italian and American cuisine.